This month, Microsoft have just launched their new technology, SurroundWeb, a concept which can turn every item in the room into an internet platform. Through use of a 3D camera, the technology can project web pages or applications onto any surface you desire, fitting them to the shape of that particular object. Watch TV on the wall, while online shopping on the floor, while playing a game on the table… the possibilities are endless! Here at StockdaleMartin, we like to keep up with the latest advances in technology. 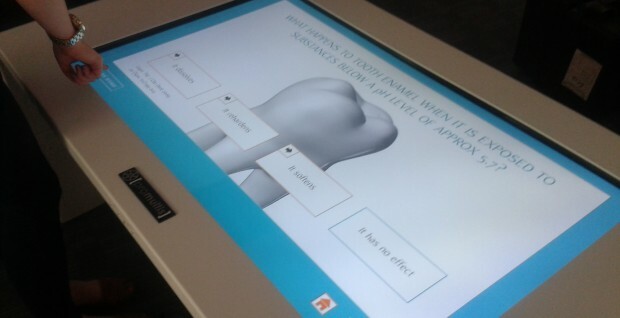 We’ve just acquired an interactive, multi-touch table, which is something we’ve really enjoyed producing content for. The table enables multiple users to take part in an activity or game at the same time, providing a fun interactive experience for your customers. It’s an ideal way to communicate your key messages, at a trade exhibition, for example. You can also use it to play games, browse the web and much more! What new technology have you been amazed by?